Double bundle, traditional single bundle or 'more anatomic' single bundle ACL reconstruction? A recent 2012 'online first' publication in the KSSTA journal (Knee surgery, sports traumatology, arthroscopy) entitled 'Patient selection of anatomical double bundle or traditional single bundle ACL reconstruction' highlights the trend within medicine of considering patient opinion and expecting patients to become more informed. The normal ACL (anterior cruciate ligament) is anatomically composed of two bundles, named for their location - a longer antero-medial (AM) bundle and a shorter postero-lateral (PL) bundle. A 'double-bundle' procedure attempts to replace each of the bundles. It is more challenging to perform, and from the patient's perspective there are two additional bone tunnels and one additional incision (skin cut). Traditional single bundle ACL reconstruction uses a thicker single graft, where the tibial tunnel is drilled and this determines the placement of the graft. The newer 'anatomical' (more anatomical) single bundle reconstruction has separate tunnels for both tibia and femur, allowing a more anatomical positioning on the femur. In this paper the surgeons felt that it was appropriate that a patient should be informed of the difference between double bundle and single bundle ACL, but I think that in doing so one needs to differentiate between traditional single bundle and the newer concept of anatomical single bundle. In the UK, I think the number of double bundle procedures being performed is going down. In 2010, I was at a major knee meeting in Warwick and it seemed then that all the talk was about double bundle! This year (2012) they did a quick hands-up survey - accepting that a few of the leading knee surgeons in the country weren’t there - but most were - when asked how many surgeons were routinely doing double bundle ACL reconstructions not one hand went up. I think surgeons are gradually coming round to the important concept of anatomic single bundle reconstruction with the graft placed in a mid-bundle position on the femur through an independent femoral tunnel drilled through an appropriate medial portal. This allows both the femoral and tibial tunnels to be placed accurately and independently. This technique is straightforward, predictable and reproducible although it presents technical challenges for the traditional transtibial technique advocates. 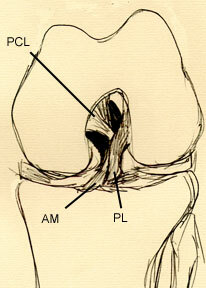 The other important recent concept is of 'filling the footprint' of the native ACL on the femoral and tibial sides using hamstrings which can be made into thicker graft constructs (4-8 strands), for example a 4 strand consisting a of a quadruple semitendinosus and leaving the gracilis in situ (i.e only harvesting one tendon) or a 6 strand construct consisting a quadruple semiteninosus and a double gracilis. These thicker grafts fill more of the ACL footprint and may provide a more rotationally stable construct. There is less need for a double bundle reconstruction with its technical issues, in particular tensioning of the posterolateral bundle, especially as the clinical differences in outcome are not proven. However I must admit the ‘double bundle’ concept has definitely improved our single bundle techniques as more consideration is given to anatomy and rotational stability. Even recently - at a cadaveric knee meeting this month (March 2012) in Munich – there was essentially no mention of double-bundle surgery at all. It was amazing that the audience (like in this paper in the esska journal) were still comparing anatomic single bundle with traditional UK single bundle transtibial techniques, where the procedure was dictated by the instrumentation and the femoral tunnel depended completely on the tibial tunnel. In Australia and in particular Sydney where I did my fellowship training, the leading knee surgeons seem to have always perfomed a more anatomic ACL reconstruction and independent femoral tunnel drilling has always been routine. I think most of the high volume knee ligament surgeons in the UK now will be using anatomic single bundle ACL reconstruction with independent femoral and tibial tunnel drilling, that is getting them both correct and then tensioning and fixing the ACL with a proven fixation device. We now - through education and workshops - need to convert our colleagues. If they were the only two options (double bundle vs. traditional transtibial single bundle ACL) then I think most sensible people would go for option one (the double bundle option) but this paper makes no mention of anatomic single bundle ACL reconstruction - this is more common and should be included in future studies. It also doesn’t describe the complications and technical issues and unpredictability of doing a double bundle ACL reconstruction. The old style traditional single bundle ACL reconstruction actually gave good results – patients got back to sport. However, the hidden instability they were subjected to led to further tears and re-ruptures, with eventual arthritis. Once it became clear that this was happening there was a move to a more anatomic position. With more anatomic positioning of the femoral and tibial tunnels the traditional test for ACL instability the pivot shift is eliminated. This will hopefully provide a more stable and functional knee.